We are coming to the close of the Religious Education program year. We have spent a year reflecting on the gifts of Six Sources of religious inspiration that Unitarian Universalists have identified. 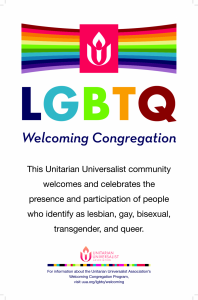 These six are not all-inclusive of course, but they give a window into the breadth of Unitarian Universalist faith. The six are areas that speak to many of us – that call us. A call is an interesting thing. Ministers and other religious professionals often speak of their ministry as a calling. Activists urge others to change the world with a call to action. Children are told to find their calling – what are you drawn to do, to be? Where are your talents? The expression has been used in both theistic religious ways – to express being called by God to do something, for instance. It has secular usage to simply describe a powerful draw to action. We might talk about a need to act or being called by love and joy and hope. I recently found myself in a conversation about the difference between a job and a calling. Some jobs we do out of duty or necessity, but the jobs we find most meaningful are the once that call us – that we feel passionately driven to go beyond mere job duties. A person who is called to heal works late into the night beyond their official hours. A person who is called to create art might spend days absorbed in their work. A minister or counselor might take calls late into the night, changing a life or two. I think calling also applies to our church community – we are called to be part of this congregation, to help each other grow, to share our gifts with each other, young and old. Volunteers have one of the most amazing callings. Volunteering can be rewarding when you see the results achieved, but just as often, the rewards are unseen. We do not know the difference we made in a moment spent talking with a child, sharing a story, or feasting together. Thank you to all of you who made religious education classes your calling this year. Your dedication and commitment are what made this program a success.